My mom has pretty good taste in home decor. I almost always run something by her before I make a change in my home. There was just something about her family room that I couldn't put my finger on. There was just too much of a hodge podge happenin'. So while home for Christmas this year, I decided that what would help this space a great deal was to do something about those rather tragic throw pillows. Amazing how changing up the pillows created a totally new look! Wish I had a before of the couch when it was green checked with flowers. Mom recovered it several years ago herself. She has vowed to never tackle a sofa - of any size - again! I just flipped it over and added a large fabric rosette. Stay posted for a tutorial on how to easily create the third pillow - that funky "striped" one. I had fun designing it! Wow...those new pillows pack a punch! Great makeover. Thanks for sharing. I love the pillows. Your couch looks great. 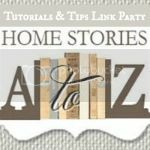 I have a link party called Wednesdays Adorned From Above Blog Hop and would love to have you share this and any other posts with everyone. It runs from Wednesday through midnight Sunday. Here is the link to the party. I hope you're having a great New Year! Wow those look great!! Funny how pillows can make such a difference. How did you make the rosette? I love that you flipped the pillow-good compromise for both of you!